Please contact us if you have these items to sell!! Your time is important, so let us locate a buyer for your equipment and make the necessary arrangements for the sale. Contact us by using our convenient online form. 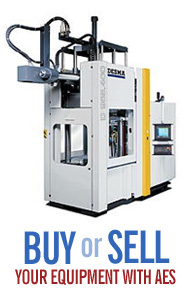 Want us to find a seller of the equipment you require?? Contact us using our online form and we'll add the item you're looking for to our listed of wanted equipment. © Copyright 2019, AES RUBBER EQUIPMENT, LLC. All rights reserved. Website Design by: eStudio Design, LLC.